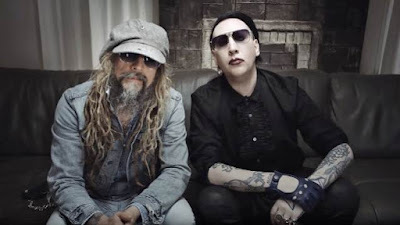 Rob Zombie is surveying fans for cover song suggestions for a possible new track with Marilyn Manson ahead of the pair’s summer tour of North America. In sync with a 2018 trek, the duo released a version of The Beatles 1968 classic, “Helter Skelter”, and now the rocker reveals they’re looking for input ahead of their 2019 run. Among the suggestions already offered by fans include tracks by Motley Crue (“Shout At The Devil”), Alice Cooper (“Teenage Frankenstein”), Bauhaus (“Bela Lugosi's Dead”), Motorhead (“Ace Of Spades”) and Billy Idol (“Rebel Yell”), among others. Zombie and Manson will launch the “Twins Of Evil: Hell Never Dies” tour in Baltimore, MB on July 9. The pair have just added two new concert dates.to the series – an August 2 stop at the Moda Center in Portland, OR and an August 3 show at the White River Amphitheatre in Auburn, WA – with general public tickets going on sale Friday, March 29 @ 10:00 am PDT.